Cornerstones was City Council's five year plan (2006-2010) to increase the number of long term affordable housing units and advocate for increases in income supports and support services funding for lower income Edmontonians in need of housing. 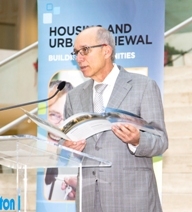 On November 20, 2012, Mayor Stephen Mandel joined Cornerstones partners and Sustainable Development General Manager Gary Klassen in City Hall to proclaim Housing Week and to celebrate the success of the Cornerstones program. From 2006 to 2011, Cornerstones helped Council create and upgrade 553 secondary suites and over 3,300 safe and affordable homes for citizens. A second phase of the successful Cornerstones program, Cornerstones II, is now underway for 2012-2016. Cornerstones II includes another five-year secondary suite grant program, as well as the Curb Appeal Program. The City has established a number of grant programs under the Cornerstones II Plan. Find out more about the City's efforts to support affordable housing provision and development. A summary of progress on the Cornerstones Plan for Affordable Housing.